The first season of Westworld held a somewhat common dramatic shape: After a raucous start, it slowly devolved into some narrative wheel-spinning before it came roaring back to life with some late-game fireworks. Season two has been a trickier beast. After a tepid start, we’ve experienced a lot of peaks and valleys and the show was often at its best when it pulled away from the guessing games and layered timelines and told contained, humane stories. But we have come to the end and I have to admit that this finale is not only my least favorite episode since the season-two premiere, but also that I’m a bit perplexed. Not just in terms of certain logical points (which we’ll get into), but I’m wondering about the overall storytelling approach. What should feel like a cathartic release, or a dagger to the chest, instead largely feels like a dreamy act of treading water — one where I couldn’t help but find myself feeling disaffected by the majority of it. Perhaps it’s that the episode has no real dramatic pacing, rhythm, or crescendo, feeling hurried and yet static all at once, especially as it goes through a lot of purposeless cross-cutting. Or perhaps it’s just hard to watch an episode that’s constantly explaining itself as it goes along, just as it’s hard to watch an episode stretched out to 90 minutes be full of relatively dead air. Even the ending series of vignettes play out with little dramatic purpose, an inhuman series of speeches where characters seem to lecture one another rather than discuss or fight. Most of all, when I look at the big ending reveal with Charlotte, I can’t help but wonder why the show took this path at all, because timeline four ends up feeling completely unnecessary. Back in season one, the realization that William and the Man in Black were the same person was purposeful because that realization belonged to Dolores’s character arc. But this time, there is no real purpose in holding it back. Maybe the show is just like Lucille Bluth and it gets off on being withholding. At least the beginning showed promise. I loved the little details of Dolores lying next to Teddy in grief, along with the mournful way she tells Old William, “I drove him away.” It’s these little interiors that remind you of the person underneath the rebel, the kind person she has had to steel herself against. There’s also the sadistic detail of the doctor casually swiping up the pain setting before digging into Maeve (along with her self-saving escape with the army of bulls!). But these little moments go by the wayside as all of our characters start marching toward the Valley in step. Speaking of which, an Old William and Dolores team-up makes zero narrative sense. She says, “I need a monster,” but she not only doesn’t, it all blows up just a scene later when he attacks her, so I really don’t get the point of that choice at all. Then we quickly reach the big climactic scene in the Valley Beyond. Turns out the Forge holds the data collected about all the park’s guests, although even this detail ends up seeming kind of meaningless (or at least doesn’t play into the story at hand). Far more important to the action is the digital Eden created within the Forge. It’s one that our hosts can literally run into to escape the torture of this world — Akecheta’s proverbial door, rendered physical. And for 50 minutes, we watch the battle that comes together as Bernard and Dolores dance about in the digital world, getting answers while the battle rages outside. From a dramatic perspective, the sequence plays out as a less exciting, repetitive version of the battle for the Cradle. 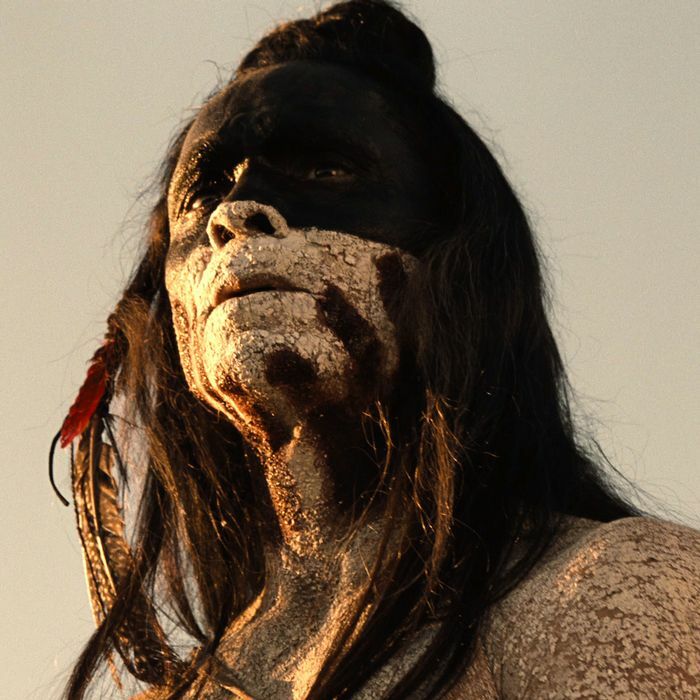 The only true highlight comes in the terrifying moment when we think Akecheta is shot, only for him to be okay the moment he crosses into the doorway. (It’s perhaps telling of the show’s grating operatics that the person I care about most in this world was introduced just two episodes prior.) But at least the episode has a series of revelations that really do play into understanding the overall philosophy of the show. Within the Forge, the likeness of Logan lets out a simple truth: The way they found “fidelity” in copying humans was not by chasing their endless complexities and little details, but in being honest about their simplicity. Their greed, self-preservation, and callousness all just add up to a few lines of code, for “the truth is that a human is but a brief algorithm.” As Ford will say, they are all just “a passenger” to their own programming. It’s, in some ways, the most cynical idea at the heart of a cynical show, that the hosts can navigate society to a better world simply because they are actually reprogrammable in a way humans are not. But it’s also perhaps the real metaphor at the heart of the show, one I find quite beautiful: The powerful “hosts” of our own society are simply those who have the power to change their behavior. Again, this is a beautiful sentiment, but it comes out as a rambling, confusing speech so it winds up feeling … inert. Meanwhile, the dramatic meaning behind the sentiment is that the show’s narrative wheel spins ever on. William is alive on the beach; the two technicians Felix and Sylvester are eyeing Maeve’s body and they’ll probably revive her. None of it feels quite like an ending, just another reset in a show that is all about resets. And while I’ve always understood the concept behind the choice, the feeling of it all is another matter. Because right when we needed fireworks, we got dreary air. But that’s nothing in comparison to the cryptic head-scratcher of the post-credits scene, in which we find out what happened when Old William went down that elevator into the Forge. There he discovers his daughter. Wait, was she a host? He discovers the facility long gone and in ruins, indicating years have passed since the other events in the finale. And he reveals what is at the true heart of his quest to destroy Westworld, and how he hates the idea that human beings can be broken down to a few lines of code, for “no system can tell me who I am.” And that’s when his daughter reveals they’re just testing his fidelity again: Yes, Old William is indeed a host. What does that mean? When is this timeline taking place? How does it all fit together? Quite frankly, I don’t know and I’m not even sure that I care. Alison Herman posted a great tweet, likely about this very moment: “WESTWORLD is a homework assignment where the reward for finishing is more homework.” There are moments of great joy and catharsis in this show, but how can you make something by forever asking questions when all catharsis comes in the way we move through our own answers, for good or ill? It’s as if Westworld itself is built on a narrative dare, one of endless resets and stasis. Sometimes, that’s the reason why the show soars. Sometimes, that’s the reason it crashes. And when it crashes, it’s because Westworld can’t seem to believe there are moments when the audience wouldn’t want the weight of more homework. Sometimes we just want to hear a great story. • Lee Sizemore’s final standoff is quite the character moment, but one that feels a bit unearned. I get his arc of cowardice and finding new selflessness, but the part that’s missing in building to that kind of sacrifice, psychologically speaking, is a dramatic articulation of the indescribable guilt of what he has done. • At least William’s host-ness explains how he got shot so many times? • So there are two Doloreses now, right?